Youth Choir Open House – Wednesday, August 29, 5-6 p.m.
Social gathering with introductions and wine/cheese reception for parents. Join us to learn more about this amazing program! RSVP right here today. Scroll to see our intro video and more info about the Youth Choir. Comments - Please include your cell phone, in case there is a change in plans. St. John’s Youth Choir is holding auditions! Boys and Girls age 7 1/2 and up are encouraged to learn more about this amazing program that promotes team-building, musical and spiritual education, and fun. The St. John’s Youth Choir forms the soprano section of our intergenerational choir in the Anglican choral tradition, singing major choral works in worship every other Sunday with the adults. 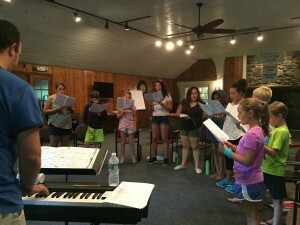 The season begins with Choir Camp in early August, and auditions are held throughout the year by appointment. New singers may join at any time. 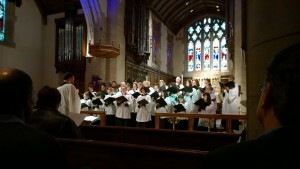 Singers in the St. John’s Youth Choir make music at the highest level, alongside adult singers. The boys and girls have a special opportunity to develop the values of self-esteem, positive attitude, respect, team spirit, discipline, and service to others, all while experiencing the power of music with professional, adult expectations. By the time of graduation (or advancement into our adult program), singers will have confidence to meet many of the challenges of their future lives. St. John’s church is a beautiful, safe, inspiring place. The hard work of singing well, and also a lot of fun! Making new friends who are as excited about music as you are. 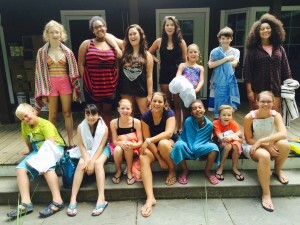 Travel, non-singing activities, and a fantastic choir camp in August, including confidence training, swimming, skits, outdoor fun & more. A monthly stipend, based on attendance and level of experience. Pay ranges from $12 to $40 per month. Rehearsing one day a week, and singing two Sunday mornings per month. Brain power! The study of music stimulates and often dramatically improves a child’s overall intellectual development and academic performance. A choral education teaches problem solving, spatial reasoning, cooperation and an appreciation or excellence, along with patience. Parents will find themselves part of an extended and vital “choir family” proud of the whole team’s accomplishments. As the choir sings every other Sunday, there is considerable flexibility in scheduling other activities including participation in other churches. The most important requirement after formal admission to the choir is an unwavering commitment of time – steadfast attendance at rehearsals and services. Schedules are published online well in advance (Click here for Choir Calendar) and families are expected to plan around them. Absences are granted under special circumstances, except on certain days in the life of the church, such as Christmas Eve and Easter, when we need everyone present. There is no enrollment fee. Costs are paid by the Church, except for choir camp and certain trips, for which financial aid is available. Audition now for the new season! Use the handy form below, and we’ll be in touch to arrange a time. Questions? Contact Scott Lamlein here or Read more about Youth Choir dates and policies. You will be contacted to confirm an appointment time. The audition will be a simple vocal placement involving singing a warmup and basic passages of music, and a general discussion. Please use the form below. List 2 or 3 possible audition dates/times WITHIN these available times.